Another healthy recipe (and great for easy breakfasts the rest of the week). It’s often hard to find tasty breakfast recipes that incorporate vegetables so leave it to Ina to come up with the addition of proscuitto to make these mini frittatas delicious and good for you. Preheat oven to 375 degrees. Brush a standard 12-cup muffin tin with olive oil, including the top of the pan. Heat the olive oil over medium heat in a large saute pan. Add the leeks and saute for 3 minutes, until tender. Add the prosciutto and saute for 2 to 3 minutes, breaking it up with a fork. Add the spinach, tossing with tongs, then cover the pan and cook for 3 minutes, tossing once while it cooks, until the spinach is all wilted. Remove from heat and stir in the basil and lemon juice and set aside while you put together the egg mixture. In a bowl, beat the eggs, half-and-half, salt, and pepper together until blended. 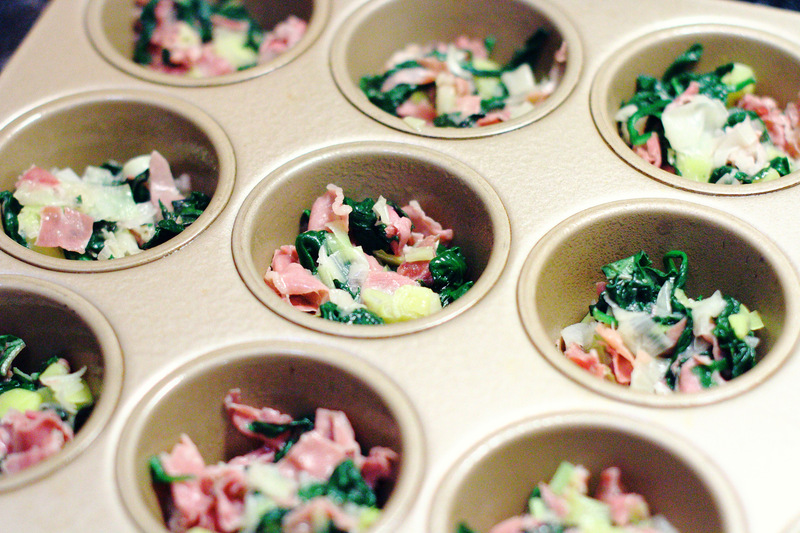 Divide the spinach mixture evenly among the 12 muffin cups, leaving an liquid behind. Sprinkle the fontina evenly on top. 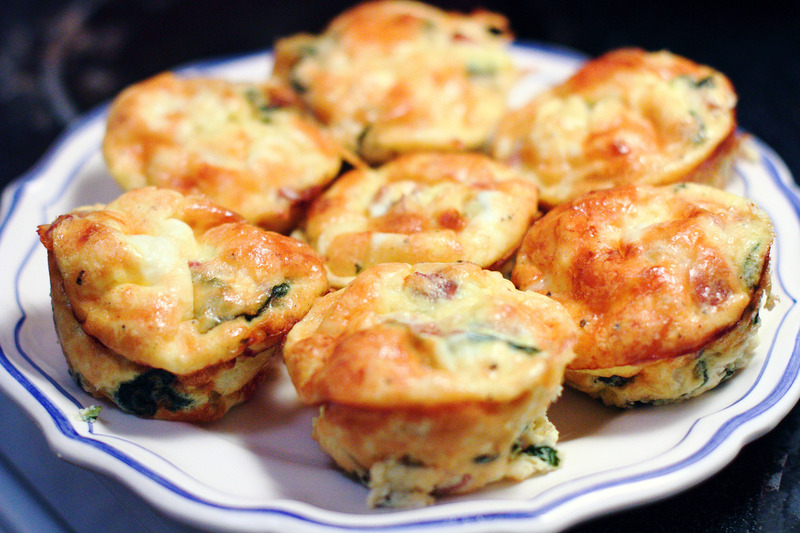 Pour the egg mixture evenly over the filling in each cup, filling the muffin cups to the top. Sprinkle each frittata with the parmesan cheese. Bake the frittatas for 20-25 minutes, until puffed and lightly browned on top. If you insert a toothpick in the middle, they should feel firm. Cool for 5 minutes, remove with a sharp knife, and serve hot or warm. I'm a fan of the frittata, though usually for dinner rather than breakfast! Oh my goodness this looks so delicious! Those look really good. Ina has the best recipes. I love her roasted potatoes. Is it possible to make ahead and freeze? You know, I’ve never tried, but I do know that you can make breakfast sandwiches ahead, freeze, and reheat them, so I don’t think this would be any different. Here’s a post about making breakfast sandwiches ahead: http://www.thekitchn.com/how-to-make-freezerfriendly-breakfast-sandwiches-cooking-lessons-from-the-kitchn-215888. 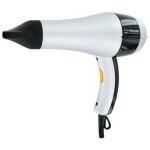 If you try it, please let me know how it works out! 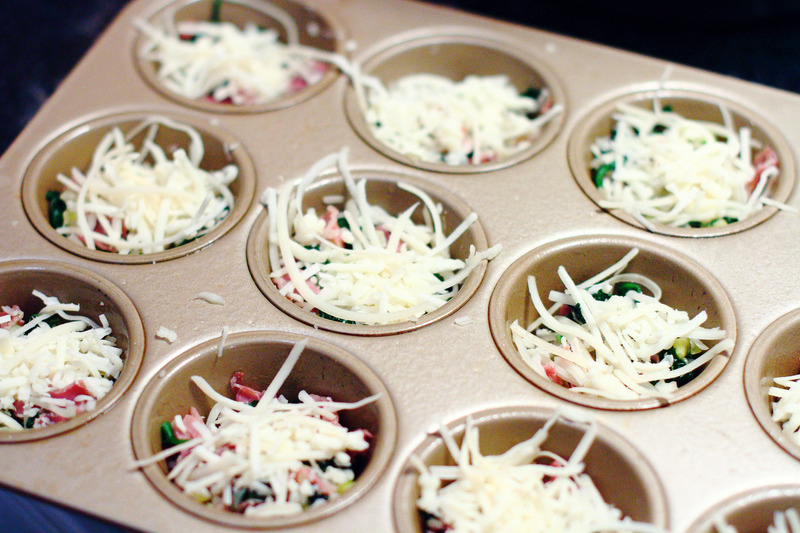 Have you ever tried making these in a mini muffin tin to use as an hors d’oeuvre? I have not, but that’s a pretty genius idea! If you do, please send me the results! I want to make these for a brunch this weekend but make them the night before. Should I reheat them in the muffin tin? Or taken out and placed on a cookie sheet? Thanks! I would maybe reheat them in muffin tin so they don’t dry out, but they’re small and probably reheat quickly so I’m sure either is fine! I ended up making two muffin tins. One tin I removed all the frittatas and replaced to reheat the next morning. The other tin I left them in to cool before reheating again. There was no noticeable difference between the two as far as dryness! The ones that were taken out were a little easier to take out again the next morning. They were a little salty however. Next time I’ll use less salt. Thanks! I’m so glad to hear that! 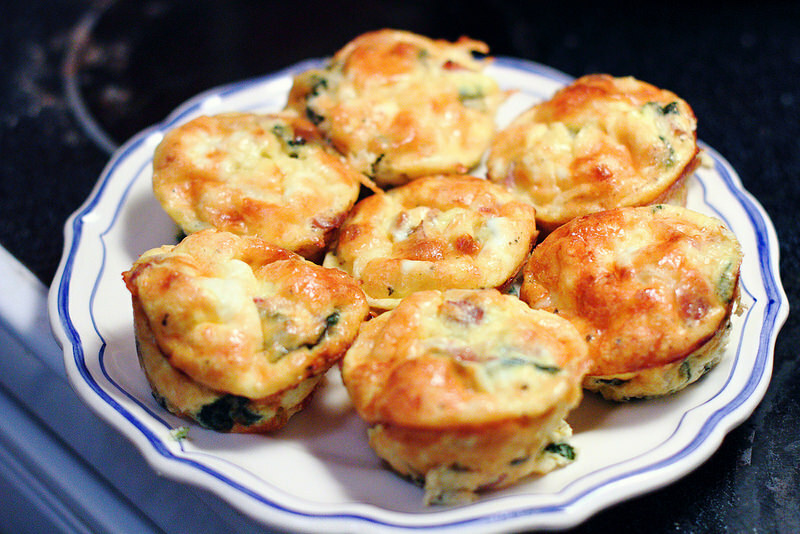 I usually make them for a workweek breakfast and just microwave them, but I bet it would be even better to do it in the oven for a party or a brunch! Instead of cooking. Ahead could everything just be left in the muffin tin overnight and then cooked the next morning? That’s a good idea, too! I don’t see why that wouldn’t work! These were fantastic! I just made them for Galentines Day (doubled the recipe, half with prosciutto and half without). They were a hit! If making them for a crowd, I would suggest prepping all the ingredients you can the night before (chop the onions, grate cheese etc.). These were a bit more work than other frittatas and I found myself in the kitchen a bit longer than I would have liked when my guests were here. You could 100% alleviate that by doing a little prep the night before. They’re not hard, just a lot of chopping/grating! I am so glad to hear it! These are great tips and I’ll definitely keep them in mind next time I make them! I don’t believe they are salty because of salt, I think it’s too much prosciutto. When I make them again, I won’t use as much as called for. Caution about keeping them in the muffin tin; when I took them out, there was water in the bottom I assume from the spinach. Not sure. Amen to the advice, do what you can the night before! Good to know Kathleen! Thanks for your tips! Easy, delicious and a crowd pleaser. I get asked for this recipe when served to guests. They look very pretty on a plate with some greens and Fruit. Served with a crescent they make a perfect brunch. Isn’t Ina the best? You’re reminding me I need to host a brunch party and make these again soon!